Since my favorite card shop was still waiting on their delivery of this product I resorted to my back-up store to check out. Normally this store is incredibly overpriced, however, on this product they are probably the best price around at $4.75 per hobby pack. I have zero patience when I want to check something out and will exhaust all avenues before waiting which is why I ended up getting packs at this place. 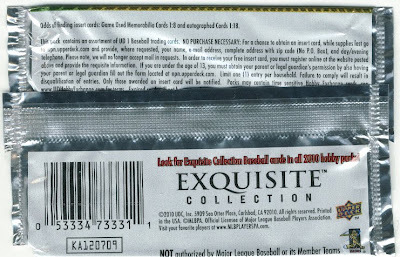 I asked the guy behind the counter to pick the packs for me since I always pick air, and the last time I bought packs there I pulled a BTL auto from 09 SP Authentic. He picked out 3 packs for me, I paid and left. Sort of. I can't buy 3 of anything and it felt dirty almost so I had to go back and get one more. I opened the one I picked first just to see how great my instincts are, and well wouldn't you know... AIR! Overall, I think I did ok on what I pulled. -Biography subset is exactly what last the Documentary set should have been if they had put an hour of thought into that set in the first place. This set chronicles one game for each game of the season, with the correct player on the card (what a concept). 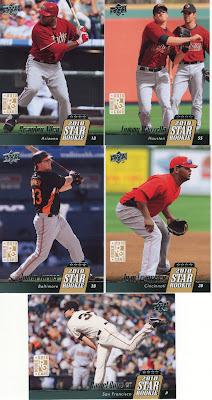 -Big fan of die cut cards as inserts, they are always fun to pull. Dislikes, well I don't really have one yet. 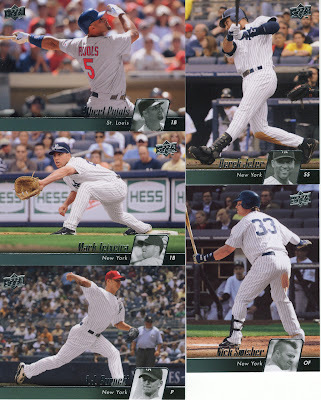 If I were a set builder I might be kind of annoyed that there are 600 cards in Series 1, but that is the norm for Upper Deck so I would also be used to it, I suppose. 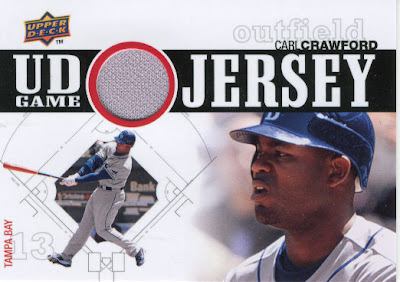 I also think the game used jersey card design is the same as a year or two ago with minor tweaking. 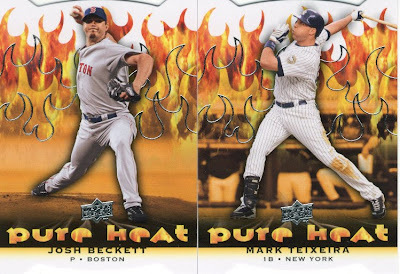 The only card that wasn't grouped into the same pack as these base cards was Jeter, the rest of the scan were in one super glorious pack. I scanned the Rookie cards I got so you guys could check them out. The logo they designed isn't terrible but not sure they needed to point out that it's a rookie card twice on the card. 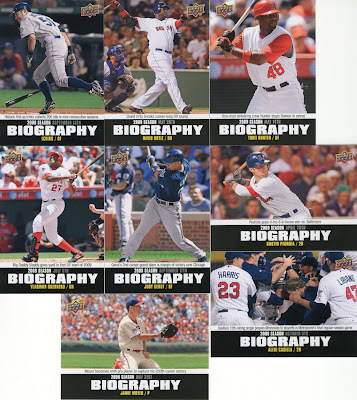 Biography subset, 2 per pack. Nothing too exciting to me. Portraits cards, which some of you seem to hate. 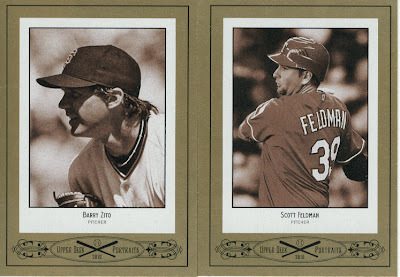 I rather like them, but then again I like vintage looking cards of todays players. Crawford, the next Yankees outfielder... LOL, kidding. This last card I actually bought from the store. They opened up one pack to show what the cards look like and what not and I asked to look through them and saw this. I picked it up for a buck, which is way better than paying $3 shipping on eBay. There you have it. 4 packs of hobby fun. I was also at the hobby shop tonight after getting an e-mail from them. I'll tell that story after I put in some study time with my Anatomy & Physiology books. I got a Melvin Mora jersey LOL. Oh well I guess that's what I get for retail. I like the Portrait cards too. 600 cards isn't the norm for UD. 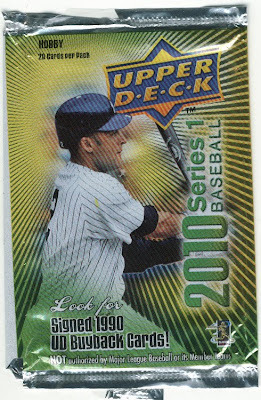 Going back to 2001 when I got back in the hobby from my hiatus and started building UD sets each year from boxes, 600 cards is the largest single series UD has put out in that time. 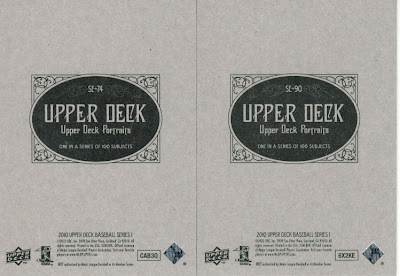 If UD doesn't have any legal actions that prohibit card manufacturing and if they put out a second series as large as this one, they are on par to put out the largest combined base set that I can think of since I've started setbuilding them. I'm pretty stoked today - got locked in for 3 boxes of 2010 UD 1 for under $60/per, when most places have it upwards or over $70/per. 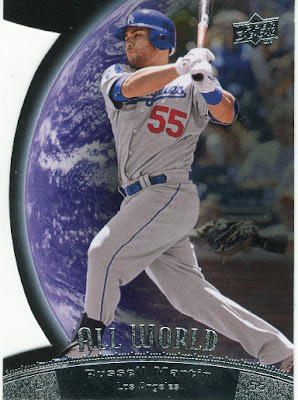 I'll be all set to start setbulding 2010 UD 1 as soon as I finish opening the 2010 Topps 1 box that is coming Monday. I like those portrait cards and those Pure Heat die cuts. First time I've seen either of them posted about, thanks!